I usually opt for the powdered cream donut at The Donut Pub. I happen to really like their bavarian cream; not too sweet, with rich vanilla egg flavor. 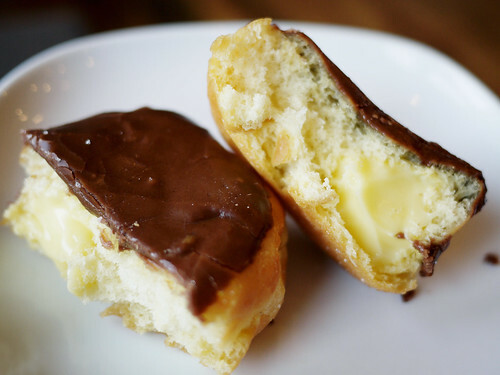 For some reason I went for the boston cream donut today, and am wishing the I hadn't. It's still pretty tasty, but I find the chocolate frosting a bit too sweet with the cream combo. I think I'll go get myself a glass of milk. Wow its so yummy im craving for this.